Electrical dangers such as shock, electrocution, arc flash and arc blast will always be present on the job, but safety strategies and proper training can minimize the likelihood of injuries and fatalities. Those at risk are employees who work on or near exposed energized electrical conductors or circuit parts, including electrical maintenance personnel, operators, engineers, supervisors or anyone exposed to energized equipment of 50 volts or more. The majority of hospital admissions following electrical accidents is due to arc flash burns, not electrical shock, so protect workers with the following tips. 1. 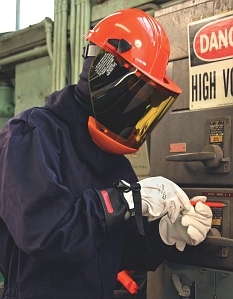 Identify hazards through arc flash hazard studies. Performed by qualified engineers and technicians, a CSA Z462-compliant arc flash hazard analysis determines potential arc flash incident energies and boundaries, shock hazard boundaries and proper personal protective equipment required for activity within the arc flash boundary. According to CSA Z462, this analysis should be updated when a major modification or renovation takes place and be reviewed periodically, at least every five years, to account for changes in the electrical distribution system that could affect the results of the analysis. 2. Affix proper warning labels to all plant equipment. Ensure warning labels identifying potential hazards and required safety equipment are affixed to applicable electrical equipment. The Canadian Electrical Code (CEC) mandates that electrical equipment shall be field-marked to warn persons of potential electrical shock and arc flash hazards. 3. Select the right personal protective equipment (PPE). Determine the calorie rating for your PPE. A calorie is the energy required to raise one gram of water one degree Celsius at one atmosphere. Approximately one calorie is the heat energy your finger receives if you hold it in a cigarette lighter flame for one second. Applied for one second, 1.2 calories per centimeter squared can cause a second-degree burn. Once the calorie rating is determined for the amount of energy that could be delivered to a point at a distance from an arc flash, the ATPV rating is calculated and proper PPE can be selected. To provide maximum worker safety and protection from burns or electrocution, it is recommended that an accredited product specialist be consulted to ensure the proper PPE selection process is followed and to provide proper training and ongoing support required for compliance. 4. Provide training for proper care and use of PPE. It is imperative that workers understand how and why the required PPE will help them as well as how to properly care for and inspect this equipment to comply with legislation. Rubber insulating gloves, arc flash clothing, face protection, temporary grounding equipment and phasing devices have specific application ratings. Rubber insulating gloves, grounds sets, live line tools and metering/phasing equipment have recertification requirements. To maintain the highest level of insulating protection and ensure long life, it is essential that the rubber gloves are properly cared for, stored, inspected and electrically tested on a regular basis. Recertification of rubber insulating gloves, as per ASTM F496, requires that re-test intervals should not exceed six months. 5. Minimize plant equipment failure through regular maintenance. Early detection of electrical equipment weakness or potential hazard through regular maintenance of high and low voltage electrical and mechanical components and analysis of electrical insulating fluids, helps to reduce production downtime and associated costs, but most importantly, improves safety conditions for system operating personnel. Robert Burgess is president of Lineman’s Testing Laboratories of Canada in Toronto. For more information, visit www.ltl.ca or email lcn@ltl.ca.